This the the Beatles first hit in the US in 1964. 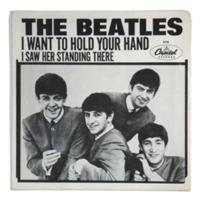 "I Want to Hold Your Hand" was first recorded in the United Kingdom in 1963, but released in the US in 1964. It was a hit! The Beatles are responsible for the "British Invasion." This song seemed to have no hidden meaning.